Gilbert Avenue in Downers Grove runs next to the train tracks. 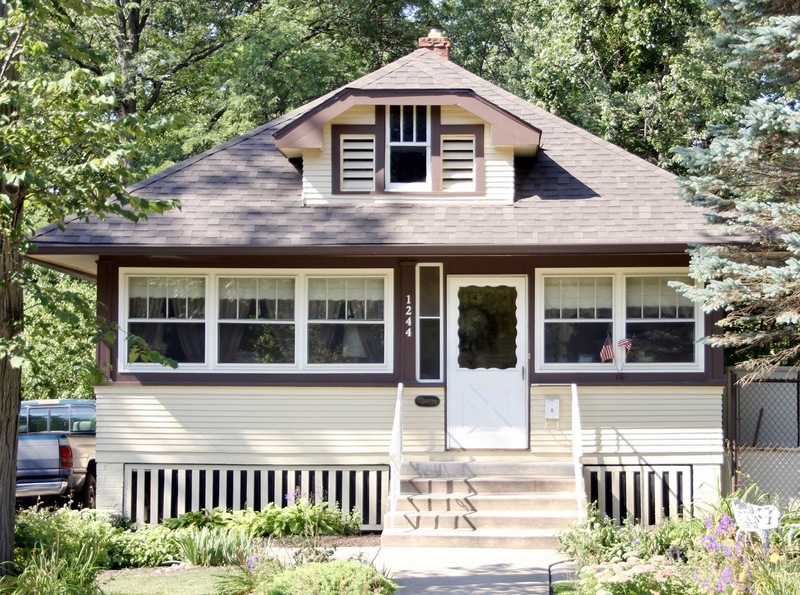 There are three good examples of kit house models on Gilbert Avenue--one a popular modest bungalow, one a California-style bungalow, and one a stately Colonial. 1244 Gilbert Ave., Downers Grove. Photo courtesy of Chuck Holtzen. The Sears Starlight is our first stop on Gilbert Avenue. 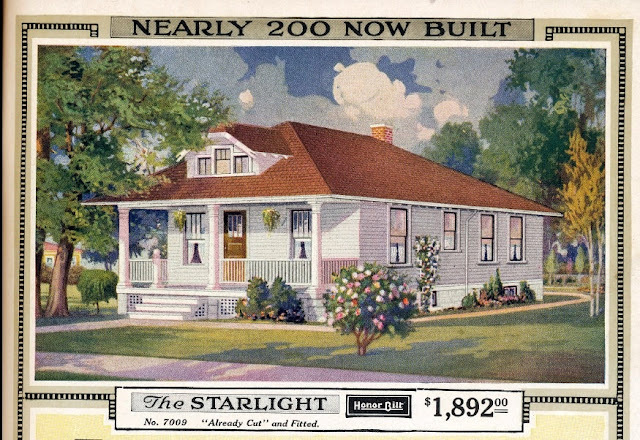 The Starlight was arguably the most popular model Sears ever offered--it was sold for 21 consecutive years. This Starlight in Downers Grove was built in 1924, according to the county. I believe the original owners were Maurice and Evelyn Smith. Maurice was a telegrapher for the railroad, which meant he had a quick walk to work. The Smiths lived in the house until about 1935. 1410 Gilbert Ave., Downers Grove. Aladdin Pasadena from the 1919 catalog. Our next stop on Gilbert Avenue is at an Aladdin Pasadena. The Pasadena is missing its original trellis, but is still recognizable. As popular as the Starlight was for Sears, the Pasadena model was a big seller for the Aladdin Company. 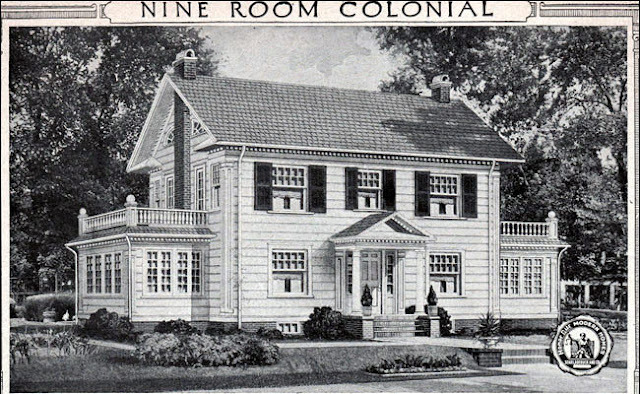 The Pasadena was featured on the cover of the Aladdin Homes 1919 catalog. In an attempt to have potential customers see the house, the Aladdin Company put the the Pasadena (and Aladdin himself) on a float in a Portland parade in 1921. Aladdin heavily marketed the Pasadena all over the country. The Pasadena in Downers Grove is authenticated--a testimonial letter from the homeowner was frequently featured in Aladdin advertising. The house was built around 1918-1919, and the original owners were Victor L. (the letter writer) and Katherine Barkey. Victor owned a shoe store in Hyde Park. Around 1930 the couple moved to Los Angeles. 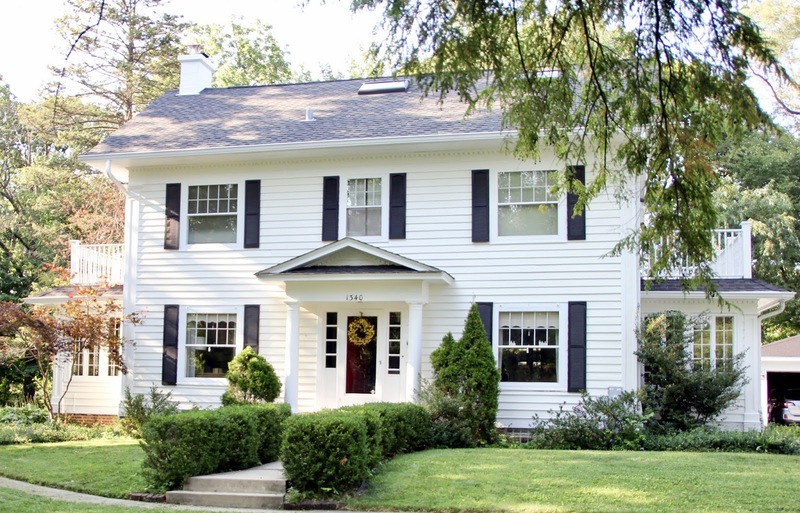 1340 Gilbert Avenue, Downers Grove. Photo courtesy of Chuck Holtzen. Our final stop is at an authenticated Sears Lexington. The homeowners found stamped lumber and they also have the original blueprints as well as photos of the house being built. The fireplace in the Lexington on Gilbert Avenue. Photo courtesy of Downers Grove Revisited. County records show that the Sears Lexington was purchased in 1925 by Charles K. and Jane Henderson. They got a mortgage from Sears Roebuck for $10,000. Charles was a manager for a rubber company. That 3-window Lexington is so stately. Those deep eaves, and wide windows really make it look rich. I agree--the Lexington is one of my favorites. It was the third most expensive house Sears ever sold! Enjoyed this post and learning more about the Pasadena home. Thanks!